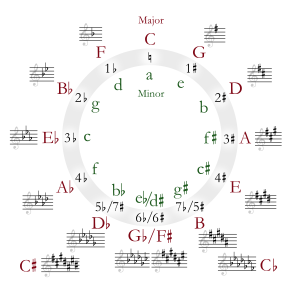 F major (or the key of F) is a musical major scale starting on F. Its key signature has one flat. Its relative minor is D minor and its parallel minor is F minor. Of the six Overtures Francesco Maria Veracini wrote for Prince Friedrich Augustus in Dresden, most are in either F major or B-flat major because the prince's orchestra had a lot of wind instruments that played best in these keys. Wikimedia Commons has media related to F major. This page was last changed on 11 March 2013, at 12:21.